Objectives Tofacitinib is an oral Janus kinase inhibitor for treatment of psoriatic arthritis (PsA). We evaluated patient-reported outcomes (PROs) in patients with PsA refractory to ≥1 conventional synthetic disease-modifying antirheumatic drug (csDMARD-IR) and tumour necrosis factor inhibitor-naïve in a 12-month, phase III randomised controlled trial (OPAL Broaden [NCT01877668]). Methods Patients (N=422) received tofacitinib 5 mg or 10 mg twice daily, adalimumab 40 mg subcutaneously every 2 weeks or placebo advancing to tofacitinib 5 mg or 10 mg twice daily at month 3. Least squares mean changes from baseline and percentages of patients reporting improvements ≥minimum clinically important differences (MCID); and scores ≥normative values in: Patient Global Assessment of disease activity (PtGA), Pain, Patient Global Joint and Skin Assessment (PGJS), Short Form-36 Health Survey version 2 (SF-36v2), Functional Assessment of Chronic Illness Therapy-Fatigue (FACIT-Fatigue), EuroQol 5-Dimensions-3-level questionnaire (EQ-5D-3L) and Ankylosing Spondylitis Quality of Life (ASQoL) were determined. Nominal p values were cited without multiple comparison adjustments. Results At month 3, PtGA, Pain, PGJS, FACIT-Fatigue, EQ-5D-3L, ASQoL and SF-36v2 Physical Component Summary (PCS), physical functioning (PF), bodily pain (BP) and vitality domain scores exceeded placebo with both tofacitinib doses (p≤0.05); SF-36v2 social functioning with 5 mg twice daily (p≤0.05). Percentages reporting improvements ≥MCID in PtGA, Pain, PGJS, FACIT-Fatigue, ASQoL and SF-36v2 PCS, PF, BP and general health scores exceeded placebo with both tofacitinib doses (p≤0.05) and were similar with adalimumab. Conclusion csDMARD-IR patients with active PsA reported statistically and clinically meaningful improvements in PROs with tofacitinib compared with placebo at Month 3. Tofacitinib at 5 mg and 10 mg twice daily is effective for the treatment of patients with psoriatic arthritis (PsA) and improves quality of life and function in addition to improving the signs and symptoms of the disease. In this post hoc analysis of patients with PsA and an inadequate response to conventional synthetic disease-modifying antirheumatic drugs (csDMARD-IR), patient-reported outcomes (PROs) improved with tofacitinib, compared with placebo, at month 3; many improvements were greater than the minimum clinically important differences, with low numbers needed to treat, particularly in those PROs most impacted by PsA, as well as values that met or exceeded normative scores. These improvements were reported within 2–4 weeks and were maintained to month 12. These results demonstrate that tofacitinib provides significant and clinically meaningful improvements across a range of PROs in csDMARD-IR patients with PsA, further supporting its use in clinical practice. Tofacitinib is an oral Janus kinase (JAK) inhibitor for the treatment of PsA. 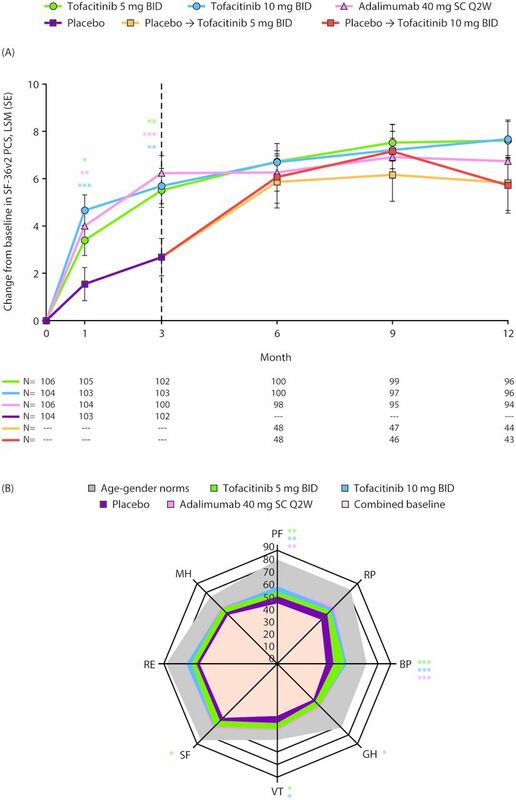 The efficacy and safety of tofacitinib 5 mg and 10 mg twice daily have been demonstrated in two phase III RCTs of 6–12 months’ duration in patients with inadequate responses to conventional synthetic disease-modifying antirheumatic drugs (csDMARD-IR) or tumour necrosis factor inhibitors (TNFi-IR) with active PsA (OPAL Broaden: NCT01877668; OPAL Beyond: NCT0188243912 13) and an ongoing long-term extension (LTE) study (OPAL Balance: NCT01976364). The objective of these analyses was to evaluate the effect of tofacitinib on PROs in csDMARD-IR patients with PsA enrolled in OPAL Broaden to assess if reported improvements were considered meaningful14–16 by evaluating the percentages of patients reporting improvements ≥minimum clinically important differences (MCIDs) and scores ≥normative values at month 3 in each treatment group. Eligible patients were randomised 2:2:2:1:1 to tofacitinib 5 mg twice daily, tofacitinib 10 mg twice daily, adalimumab 40 mg subcutaneous injection once every 2 weeks, placebo advancing to tofacitinib 5 mg twice daily at month 3 or placebo advancing to tofacitinib 10 mg twice daily at month 3. Patients received a stable background dose of a single csDMARD (methotrexate: 83.6%; sulfasalazine: 9.2%; leflunomide: 5.7%; hydroxychloroquine: 0.2%; other: 1.2%) and were followed up to month 12. PtGA, Pain, SF-36v2, EQ-5D-3L, FACIT-Fatigue and ASQoL were secondary outcome measures, and SF-36v2 PF domain and FACIT-Fatigue were key secondary efficacy endpoints at month 3. In addition, HAQ-DI (range 0–3; higher scores indicate greater functional impairment; MCID: improvements ≥0.35 points) mean change from baseline, DLQI and Itch Severity Item (ISI) were measured. HAQ-DI responses have been reported previously,12 and DLQI and ISI results that will form the basis of a future publication are not reported here. For continuous endpoints, least squares mean changes from baseline were compared between active treatments (tofacitinib 5 mg and 10 mg twice daily and adalimumab 40 mg subcutaneous injection once every 2 weeks) and the combined placebo group, using a repeated measures model with the fixed effects of treatment, visit, treatment-by-visit interaction, geographic location and baseline values, without imputation for missing values. An unstructured covariance model was used. The two placebo sequences were combined into a single placebo group up to month 3 (the end of the placebo-controlled period). P values were calculated from these repeated measures analyses. For results after month 3, a second repeated measures model was used including visits up to the end of study for all treatment sequences. For binary endpoints, p values were calculated for comparing percentages between treatment groups, based on the normal approximation for the difference in binomial percentages. The same method was used to analyse the percentage of patients reporting scores ≥normative values. Missing values were not imputed, except for the percentage of patients reporting improvements ≥0.35 (MCID) in HAQ-DI, where non-responder imputation was prespecified for this efficacy measure. Nominal p values for the differences between active treatment versus placebo were reported without adjustment for multiplicity. For all endpoints, significance was set at p≤0.05 throughout. For illustrative purposes and to facilitate viewing improvements in HRQoL simultaneously across eight domains,24 spydergrams were generated using SF-36v2 domain raw scores (range 0–100), where published age–gender norms were matched to the study population for a benchmark comparison. Based on MCID response rates, the number needed to treat (NNT) was also calculated, defined as the inverse of the difference between PRO response rates in active treatment (tofacitinib 5 mg or 10 mg twice daily or adalimumab) and placebo groups at month 3.25 A separate analysis included the percentages of patients reporting scores ≥normative values, with ‘normative’ referring to responses in individuals in the US general population without chronic disease. The percentages of patients reporting scores ≥normative values were calculated for SF-36v2 PCS, MCS and norm-based domain scores, FACIT-Fatigue and HAQ-DI (normative values: SF-36v2 PCS, MCS and domain scores ≥50; FACIT-Fatigue Total score ≥40.1; and HAQ-DI ≤0.2526). Pearson correlation coefficients (|r|) were also assessed at month 3 with particular interest in the following PROs: HAQ-DI and SF-36v2 PF domain; Pain and SF-36v2 BP domain and EQ-5D-3L pain/discomfort dimension. Correlations between FACIT-Fatigue Total score and SF-36v2 VT domain have been evaluated and will be published in a future publication. Statistical significance for testing the null hypothesis of Pearson correlations equal to zero was assessed based on Student’s t distribution (N-2 degree of freedom, where N is the total number of patients in the analysis). The analysis included patients with observations at a visit of interest in the Full Analysis Set. In total, 422 patients were randomised and received ≥1 dose of the study drug; 373 patients completed the study. Baseline patient demographics, reported previously, were broadly similar across treatment groups12; the majority were Caucasian (96.9%), female (53.3%), with a mean age of 47.9 (SD 12.1) years and mean disease duration 6.1 (SD 6.5) years. Baseline PROs were similar across treatment groups (table 1). Significant improvements from baseline were reported at month 3 with all active treatments in PtGA, Pain, HAQ-DI, PGJS, SF-36v2 PCS, PF, BP and VT domains (tofacitinib 5 mg and 10 mg twice daily only), FACIT-Fatigue (Total score and two domain scores), EQ-5D-3L (mobility and pain/discomfort dimension scores), EQ-VAS and ASQoL, compared with placebo (all p≤0.05; table 1). As early as week 2 (the first post-baseline assessment), greater improvements from baseline in PtGA and Pain were reported by patients receiving tofacitinib 5 mg and 10 mg twice daily, compared with placebo, and maintained to month 3 (all p≤0.05 for both comparisons; figure 1A,B). Greater improvements from baseline were reported in PGJS as early as month 1 (the first post-baseline assessment) with both tofacitinib doses, compared with placebo, and were maintained to month 3 (all p<0.01 for both comparisons; figure 1C). Patients receiving adalimumab also reported significant improvements in PtGA, Pain and PGJS to month 3 (all p<0.01; figure 1). Responses in PROs in those receiving active treatments were generally maintained to month 12; patients receiving placebo who advanced to tofacitinib at month 3 reported similar improvements in PtGA, Pain and PGJS after switching to tofacitinib (figure 1). Least squares mean (LSM) changes from baseline: (A) Patient Global Assessment of disease activity visual analogue scale (PtGA-VAS) (mm); (B) Pain-VAS (mm); (C) Patient Global Joint and Skin Assessment (PGJS)-VAS (mm) arthritis and psoriasis. *p≤0.05, **p<0.01, ***p<0.001 compared with placebo; results up to month 3 were based on a repeated-measures model including data up to month 3 for tofacitinib 5 mg twice daily, tofacitinib 10 mg twice daily, adalimumab 40 mg subcutaneous injection once every 2 weeks and combined placebo group. Results after month 3 were based on a second repeated-measures model including data up to end of study for the five treatment sequences (tofacitinib 5 mg twice daily, tofacitinib 10 mg twice daily, adalimumab 40 mg subcutaneous injection once every 2 weeks, placebo → tofacitinib 5 mg twice daily and placebo → tofacitinib 10 mg twice daily), reporting results after month 3 only. Missing values were not imputed. Patient N is number of subjects evaluable at each visit. BID, twice daily; SC Q2W, subcutaneous injection once every 2 weeks. The percentages of patients reporting clinically meaningful improvements (≥MCID) at month 3 exceeded placebo with all active treatments, compared with placebo, for PtGA, Pain and PGJS (all p≤0.05). NNT values were similar across active treatments (figure 2A). Percentages of patients reporting improvements from baseline ≥minimum clinically important difference (MCID) and number needed to treat (NNT) in (A) patient-reported outcomes (PROs); (B) Short Form-36 health survey version 2 (SF-36v2) domain scores at month 3 and percentages of patients reporting scores ≥normative values in (C) PROs; (D) SF-36v2 domain scores, at baseline and month 3. *p≤0.05, **p<0.01, ***p<0.001 compared with placebo; p values were based on the normal approximation for the difference in binomial percentages without imputation for missing values (except Health Assessment Questionnaire Disability Index [HAQ-DI] MCID response, which used non-responder imputation); N is the number of patients per group in the Full Analysis Set; the number of patients evaluable for each PRO endpoint may be fewer than N; MCID cut-offs: Patient Global Assessment of disease activity visual analogue scale (PtGA-VAS) decrease from baseline ≥10 mm; Pain-VAS decrease from baseline ≥10 mm; Patient Global Joint and Skin Assessment (PGJS)-VAS decrease from baseline ≥10 mm; SF-36v2: Physical Component Summary (PCS) and Mental Component Summary (MCS) increase from baseline ≥2.5, SF-36v2 domain scores increase from baseline ≥5.0; Functional Assessment of Chronic Illness Therapy-Fatigue (FACIT-Fatigue) increase from baseline ≥4.0; Ankylosing Spondylitis Quality of Life (ASQoL) decrease from baseline ≥1.8; HAQ-DI decrease from baseline ≥0.35; MCIDs are defined here in terms of mean change from baseline to month 3 in a treatment group; NNT calculated by the inverse of the percentage of patients receiving active treatments reporting improvements ≥MCIDs minus the percentage of patients in the placebo group reporting improvements ≥MCIDs; the percentage of patients reporting scores ≥normative values: HAQ-DI ≤0.25, FACIT-Fatigue Total score ≥40.1, SF-36v2 each of the component summary and domain scores ≥50. BID, twice daily; BP, bodily pain; GH, general health; MH, mental health; NA, not available; PF, physical functioning; RE, role emotional; RP, role physical; SC Q2W, subcutaneous injection once every 2 weeks; SF, social functioning; VT, vitality. Patients receiving all active treatments reported improved SF-36v2 PCS scores compared with placebo at month 1, maintained to month 3 (all p≤0.05; figure 3A). No improvements in SF-36v2 MCS were reported at month 3 versus placebo (table 1). Patients receiving placebo who advanced to tofacitinib 5 mg or 10 mg twice daily at month 3 reported similar improvements in SF-36v2 PCS scores post-month 3 (figure 3A). (A) Least squares mean (LSM) change from baseline in Short Form-36 health survey version 2 (SF-36v2) Physical Component Summary (PCS) score; and (B) spydergram of domain scores from baseline to month 3 and versus age-matched and gender-matched norms. Panel A: *p≤0.05, **p<0.01, ***p<0.001 compared with placebo; results up to month 3 were based on a repeated measures model including data (norm-based) up to month 3 for tofacitinib 5 mg twice daily, tofacitinib 10 mg twice daily, adalimumab 40 mg subcutaneous injection once every 2 weeks and combined placebo group. Results after month 3 were based on a second repeated measures model including data up to end of study for the five treatment sequences (tofacitinib 5 mg twice daily, tofacitinib 10 mg twice daily, adalimumab 40 mg subcutaneous injection once every 2 weeks, placebo → tofacitinib 5 mg twice daily and placebo → tofacitinib 10 mg twice daily), reporting results after month 3 only. Missing values were not imputed. Dashed line indicates end of placebo-controlled period. N represents the number of subjects evaluable at each visit. Panel B: *p≤0.05, **p<0.01, ***p<0.001 compared with placebo; spydergrams were generated using domain raw scores (range 0–100); US age–gender norms were matched to the protocol population; spydergrams are for illustrative purposes only; p values were generated using a repeated measures model for comparisons with placebo based on LSM changes from baseline in domain norm-based scores at month 3 (table 1). Missing values were not imputed. BID, twice daily; BP, bodily pain; GH, general health; MH, mental health; PF, physical functioning; RE, role emotional; RP, role physical; SC Q2W, subcutaneous injection once every 2 weeks; SF, social functioning; VT, vitality. Significant improvements in SF-36v2 PF, BP and VT domain scores following treatment with both tofacitinib doses, compared with placebo, were reported at month 3 (all p≤0.05; table 1). Improvements in SF domain scores were reported following tofacitinib 5 mg twice daily at month 3, versus placebo (p≤0.05; table 1). Compared with placebo, patients receiving adalimumab reported significant improvements in SF-36v2 PF, BP and GH domains (all p≤0.05) at month 3 (table 1). Responses reported by patients receiving tofacitinib or adalimumab were generally maintained to month 12. Spydergrams of SF-36v2 domains (raw 0–100 scale) illustrate that reported improvements from baseline to month 3 in SF-36v2 domain scores were greater with both doses of tofacitinib and adalimumab (OPAL Broaden) than placebo (figure 3B). The percentages of patients reporting improvements ≥MCID at month 3 with all active treatments exceeded placebo in PCS, PF, BP and GH domains (all p≤0.05). In addition, improvements ≥MCID in MH domain scores were reported with tofacitinib 10 mg twice daily (p≤0.05). NNTs were similar across active treatments (figure 2A,B). The percentages of patients reporting scores ≥normative values were numerically higher with both tofacitinib doses versus placebo in SF-36v2 PCS, MCS and all domain scores (figure 2C,D). Significantly more patients receiving tofacitinib 5 mg twice daily reported scores ≥normative values in MCS, BP and SF domains compared with placebo (all p≤0.05). Significantly more patients receiving tofacitinib 10 mg twice daily reported scores ≥normative values in PCS, PF, BP, GH, SF and MH domains than placebo (all p≤0.05). Similar results were reported by patients receiving adalimumab. Greater improvements from baseline in FACIT-Fatigue Total score were reported at month 1 following tofacitinib 5 mg twice daily versus placebo. At month 3, greater improvements from baseline in FACIT-Fatigue Total score were reported by patients receiving both tofacitinib doses, compared with placebo (all p≤0.05; figure 4A). Improvements in ASQoL exceeded placebo at month 1 with both doses of tofacitinib, sustained to month 3 (all p<0.01; figure 4B). Patients receiving adalimumab also reported significant improvements in FACIT-Fatigue and ASQoL at month 3, compared with placebo (p≤0.05; figure 4A). Improvements in FACIT-Fatigue and ASQoL with all active treatments were generally maintained to month 12. Patients receiving placebo who advanced to tofacitinib 5 mg or 10 mg twice daily at month 3 reported improvements in FACIT-Fatigue and ASQoL post-month3. Least squares mean (LSM) changes from baseline in (A) Functional Assessment of Chronic Illness Therapy-Fatigue (FACIT-Fatigue) Total score and (B) Ankylosing Spondylitis Quality of Life (ASQoL). *p≤0.05, **p<0.01, ***p<0.001 compared with placebo; results up to month 3 were based on a repeated measures model including data up to month 3 for tofacitinib 5 mg twice daily, tofacitinib 10 mg twice daily, adalimumab 40 mg subcutaneous injection once every 2 weeks and combined placebo group. Results after month 3 were based on a second repeated measures model including data up to end of study for the five treatment sequences (tofacitinib 5 mg twice daily, tofacitinib 10 mg twice daily, adalimumab 40 mg subcutaneous injection once every 2 weeks, placebo → tofacitinib 5 mg twice daily and placebo → tofacitinib 10 mg twice daily), reporting results after month 3 only. Missing values were not imputed. N is the number of subjects evaluable at each visit. BID, twice daily; SC Q2W, subcutaneous injection once every 2 weeks. The percentage of patients reporting improvements ≥MCID in FACIT-Fatigue at month 3 were greater with both tofacitinib doses (p≤0.05) but not with adalimumab versus placebo; NNTs were similar across active treatments (figure 2A). A greater percentage of patients reported improvements in ASQoL ≥MCID at month 3 with all active treatments versus placebo (all p≤0.05; figure 2A). The percentages of patients reporting scores ≥normative values were numerically higher with both tofacitinib doses compared with placebo for FACIT-Fatigue but not significant for either tofacitinib dose. In contrast, significantly more patients receiving adalimumab, compared with placebo, reported scores ≥normative values in FACIT-Fatigue (p<0.01; figure 2C). Correlations of pre-selected PRO endpoints (based on subject matter knowledge and clinical rationale) are shown in table 2. HAQ-DI at month 3 was moderately correlated (|r| >0.30–≤0.70) with Pain and EQ-5D-3L pain/discomfort dimension for all treatment groups. HAQ-DI was also moderately or highly (|r| >0.60) negatively correlated with SF-36v2 PF and BP domains (all treatment groups). At month 3, Pain and the SF-36v2 BP domain were moderately or highly negatively correlated for all treatment groups. Correlations between SF-36v2 PF and BP domains were moderate for both tofacitinib doses and placebo, and high for adalimumab. In this study, patients with PsA who were refractory to csDMARDs reported improved PROs following treatment with tofacitinib 5 mg and 10 mg twice daily versus placebo at month 3, which were generally maintained to month 12. At month 3, clinically meaningful NNTs ≤10 were reported for PtGA, Pain, PGJS, SF-36v2 PCS and PF, BP and GH domain scores, FACIT-Fatigue Total score and HAQ-DI. NNTs provide an estimate of treatment effectiveness by determining the number of patients needed to treat in order to have one additional patient to benefit from the treatment relative to placebo.32 NNTs were similar with tofacitinib 5 mg and 10 mg twice daily and also with adalimumab, demonstrating that both tofacitinib doses were similar to the active control. In addition, correlations between preselected PRO endpoints were similar to previously reported correlations between PROs in PsA.28–31 All the PRO endpoints included in the correlation analysis were moderately or highly correlated, implying that these improvements are important and consistent with successful treatment. Furthermore, simultaneous assessment of SF-36v2 domain scores using spydergrams demonstrated that multiple domains were improved compared with baseline; however, domain scores were lower than age–gender norms matched to the protocol population. Many RCTs have assessed PROs in csDMARD-IR patients with PsA. 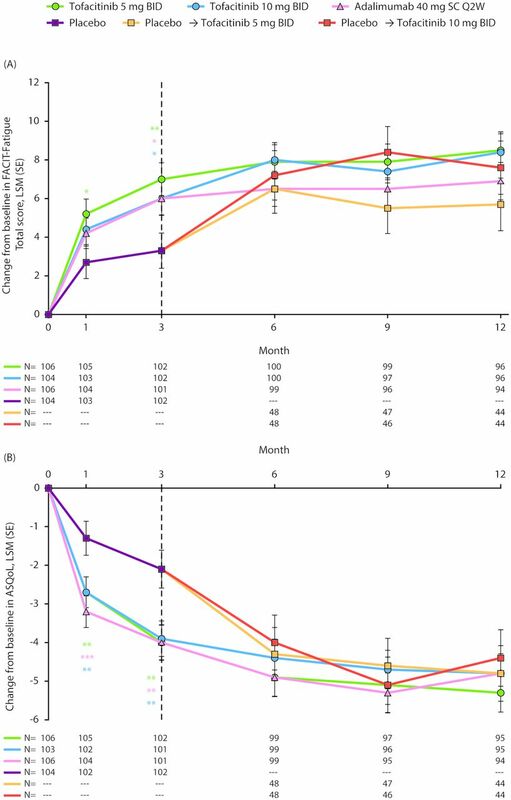 In previous phase II and phase III RCTs of apremilast, significant improvements in clinical outcomes and HRQoL were observed.28 33 An RCT of golimumab in csDMARD-IR patients with PsA reported significant improvements in HAQ-DI, HRQoL and productivity compared with placebo at month 6 that were sustained through to month 24. These improvements correlated with clinical improvement.34 Furthermore, in the Rheumatoid Arthritis PreventIon of structural Damage (RAPID)-PsA RCT, patients with active PsA treated with certolizumab pegol reported clinically meaningful differences in HAQ-DI, SF-36v2, fatigue (measured using the Fatigue Assessment Scale), Pain and DLQI at month 6, compared with placebo, but no correlation with clinical efficacy was observed.35 In addition, in the phase III FUTURE 1 RCT, patients with PsA receiving secukinumab reported significant improvements in PtGA, Pain and FACIT-Fatigue after 24 weeks of treatment.36 However, unlike OPAL Broaden, these studies did not include an active control, and an important finding of this analysis was that improvements in PROs reported by patients treated with tofacitinib 5 mg or 10 mg twice daily were similar to those reported by patients receiving adalimumab 40 mg subcutaneous injection once every 2 weeks. Fatigue is commonly reported by patients with PsA and was recently added to the PsA core domain set.21 37 38 In this analysis, NNTs for FACIT-Fatigue Total scores were lower than those for SF-36v2 VT domain and, importantly, similar to NNTs based on reported improvements in PtGA, PGJS and Pain at month 3. Patients with PsA report impairment of PF, BP and VT. However, in comparison with patients with RA, patients with PsA are less likely to report impairments in RP and VT but are more likely to report difficulties in social, mental and emotional functioning, possibly due to the skin lesions that affect patients with PsA.20 39 40 Similar percentages of patients reported SF-36v2 scores ≥normative values with tofacitinib and adalimumab at month 3. Compared with placebo, the percentages of patients reporting scores ≥normative values with either tofacitinib dose were significant for SF-36v2 PCS, MCS and PF, BP, GH, SF and MH domains, thus demonstrating that patients receiving tofacitinib are more likely to attain function, fatigue and HRQoL scores comparable with those without arthritis or other chronic conditions than those receiving placebo. Some differences in PROs were reported by patients receiving tofacitinib, compared with those receiving adalimumab. However, these active treatments have different modes of action (JAK inhibition and TNF inhibition, respectively),41 42 with distinct effects on downstream intracellular signalling pathways that are likely to be complex and multifactorial.43 44 Therefore, it is difficult to isolate the specific processes or pathways affected by JAK inhibition and TNF inhibition that give rise to differences in PROs in patients receiving tofacitinib and adalimumab, respectively. A unique feature of this study is the evaluation of components of the FACIT-Fatigue instrument that provide information on the impact of tofacitinib on patients’ specific fatigue experience (perception and severity) and the impact on daily function. A limitation is that comparisons with placebo were limited to the 3-month placebo-controlled portion of the study. Also, this trial was not designed and was not powered to evaluate the non-inferiority or superiority of tofacitinib as compared with adalimumab; therefore, comparisons should be interpreted cautiously. Furthermore, the majority of patients were receiving concomitant csDMARDs, and a similar standard of care may not be accessible in all countries, which may impact on the reproducibility of these results. In addition, use of ASQoL has not been specifically validated in axial PsA and may not be ideal for assessing peripheral PsA. Further PRO data for tofacitinib will be collected in the LTE study. In conclusion, csDMARD-IR patients with PsA receiving tofacitinib 5 mg or 10 mg twice daily reported clinically meaningful improvements in PROs compared with placebo at month 3, which were maintained to month 12 and ≥normative values in up to 39% of patients receiving tofacitinib. Patients receiving tofacitinib reported similar improvements to those receiving the active control adalimumab at the time points assessed. The results of this study provide scientific evidence to support decisions regarding clinical therapy and further support the use of JAK inhibition as a novel mechanism for treatment of PsA. Some of the results reported in this study were previously presented at AAD-w 2017 (Strand V, et al. Am Acad Dermatol 2017;76:Abstract AB109) and at ACR 2017 (Strand V, et al. Arthritis Rheumatol 2017;69:Abstract 596). The authors would like to thank the patients, investigators and study teams involved in the OPAL Broaden study. This study was funded by Pfizer Inc. Medical writing support, under the direction of the authors, was provided by Anthony G McCluskey, PhD, of CMC Connect, a division of Complete Medical Communications Ltd, Glasgow, UK, and was funded by Pfizer Inc, New York, NY, USA, in accordance with Good Publication Practice (GPP3) guidelines (Ann Intern Med 2015;163:461‑4).
. Characterization of a potent inhibitor of JAK kinases, CP-690,550, and inhibition of specific JAK/STAT pathways at efficacious exposures in a rodent model of arthritis. Chantilly, Virginia: 15th International Inflammation Research Association Conference, 2008.
. Effect of tofacitinib on patient-reported outcomes in patients with active psoriatic arthritis and an inadequate response to tumor necrosis factor inhibitors in the phase III, randomized, controlled trial: OPAL Beyond. RMD Open 2018;4:e000808. Contributors All authors were involved in the analysis and interpretation of data and critically revising the manuscript for important intellectual content. All authors agree to be accountable for all aspects of the work and read and approved the final manuscript to be published. Competing interests VS has received consulting fees from AbbVie, Amgen, AstraZeneca, Bayer, Boehringer Ingelheim, Bristol-Myers Squibb, Celltrion, Genentech/Roche, GSK, Janssen, Lilly, Merck, Novartis, Pfizer Inc, Regeneron, Samsung, Sandoz, Sanofi and UCB. KdV is a consultant and advisory board member for Pfizer Inc. JAC-C is an investigator for Pfizer Inc. PJM has received research grants from AbbVie, Amgen, Bristol-Myers Squibb, Celgene, Janssen, Lilly, Novartis, Pfizer Inc, Sun and UCB; has acted as a consultant for AbbVie, Amgen, Bristol-Myers Squibb, Celgene, Corrona, Janssen, Lilly, Merck, Novartis, Pfizer Inc, Sun, UCB and Zynerba; and has participated in speakers’ bureaus for AbbVie, Amgen, Bristol-Myers Squibb, Celgene, Genentech, Janssen, Novartis, Pfizer Inc and UCB. DDG has received research grants from AbbVie, Amgen, Bristol-Myers Squibb, Celgene, Janssen, Lilly, Novartis, Pfizer Inc and UCB and has acted as a consultant for AbbVie, Amgen, Bristol-Myers Squibb, Celgene, Janssen, Lilly, Novartis, Pfizer Inc and UCB. M-AH, DG, CW and JCC are shareholders and employees of Pfizer Inc. TH is a shareholder, and was an employee, of Pfizer Inc during the time of this analysis. Data sharing statement Upon request, and subject to certain criteria, conditions and exceptions (see https://www.pfizer.com/science/clinical-trials/trial-data-and-results for more information), Pfizer will provide access to individual deidentified participant data from Pfizer-sponsored global interventional clinical studies conducted for medicines, vaccines and medical devices (1) for indications that have been approved in the USA and/or EU, or (2) in programmes that have been terminated (ie, development for all indications has been discontinued). Pfizer will also consider requests for the protocol, data dictionary and statistical analysis plan. Data may be requested from Pfizer trials 24 months after study completion. The deidentified participant data will be made available to researchers whose proposals meet the research criteria and other conditions, and for which an exception does not apply, via a secure portal. To gain access, data requestors must enter into a data access agreement with Pfizer.